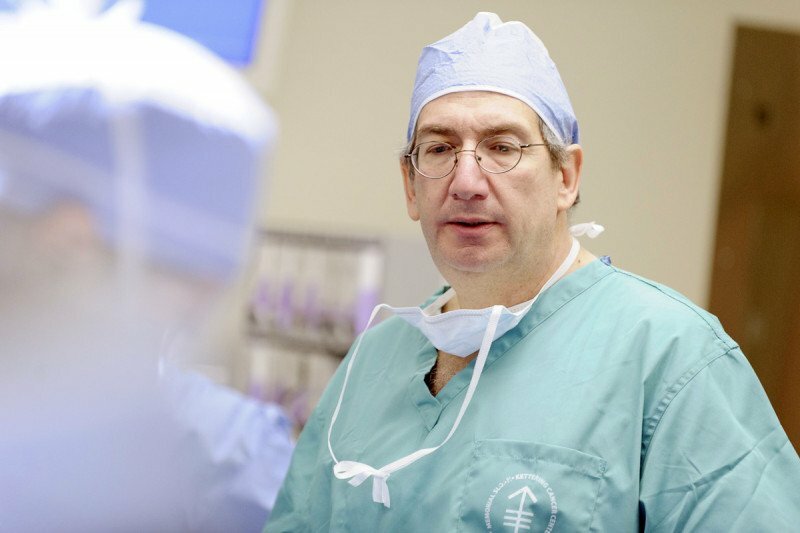 Urologic surgeon Joel Sheinfeld treats his patients with advanced surgical procedures, including a nerve-saving technique that can protect fertility. The more lymph nodes that are surgically removed from the abdomen after receiving chemotherapy for testicular cancer, the less likely it is that the cancer will return, suggests a new study conducted by a team of Memorial Sloan Kettering Cancer Center investigators. The surgical procedure your treatment team recommends for you will depend in part on how advanced the testicular cancer is – meaning its stage. For early-stage testicular cancer we usually recommend radical orchiectomy, a surgery in which we remove the tumor along with the testicle. When combined with lifelong monitoring, this can be the only treatment needed for early-stage germ cell tumors that haven’t spread beyond the testicle. Memorial Sloan Kettering surgeons more than 200 testicular procedures each year. If test results show that a tumor is likely to spread, or has already spread, to the lymph nodes in your abdomen, your treatment team may recommend retroperitoneal lymph node dissection (RPLND) to remove the affected lymph nodes. This surgery can help your treatment team determine if the cancer has spread and where to remove any cancer that might be found in the lymph nodes. RPLND does not normally affect fertility or your ability to get and keep a normal erection. Our surgeons have extensive experience using a technique that decreases the risk of the cancer spreading while still sparing nerves and preserving sexual function. Our doctors and surgeons have a variety of cutting-edge tools to help you fight cancer — it’s all about finding the right plan for you. If needed, they can combine those tools into even more-effective treatments. For instance, radical orchiectomy combined with RPLND can cure many early-stage nonseminomas. RPLND after chemotherapy can prevent germ cell tumors from returning in most men with advanced testicular cancer.